According to a new report conducted by CareerCast, jobs in the caregiving field, including in-home caregiving, and personal care aid, will be hard to fill in 2018. With the rapid growth in the demand for senior care with the Silver Tsunami approaching, there will be an ever-increasing demand for these types of “unskilled” jobs. According to the list provided by CareerCast, health care jobs in general will be five of the top ten most difficult job openings to fill in the coming year and years. Well Beyond Care understands this trend and has already taken steps to see that the need will be filled with qualified employees. Looking at the list below, home health aides were ranked as the fourth toughest position to fill, with the median salary at only $10.55 per hour, and in parts of the country as low as $8.75 per hour. Personal care aides rang in at No. 8, with a median salary of $8.75 per hours. Part of what makes WellBeyondCare.com different, is that Caregivers tend to make 25% to 40% more per hour when employed through our system. Well Beyond Care realizes that over the next eight years the demand for home health aides are forecasted to grow 47%, while personal care aides are anticipated to go 39% over the same time period during to the fact that over 4 million baby boomers per year will be retiring over that same period. This forecast is based on data from trade and professional associations and the Bureau of Labor Statistics. 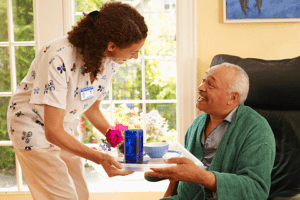 Due to a large part of how little private duty care companies pay their caregivers and how much they need to charge their clients to make a profit, it is little wonder that in-home care has been facing a labor shortage. This will become exacerbated as companies like Well Beyond Care start to siphon off more of the higher quality caregivers and as a result, see a raise in hourly wages. Conversely, by using a company like Well Beyond Care a careseeker can actually end up playing a caregiver $3 to $5 more per hour, and still save between $10,000 to $30,000 per year in caregiving costs. Well Beyond Care gives caregivers and those who need care the tools to manage their in-home care online. Caregivers, registered nurses, certified nurse assistants, and geriatric care managers can use the website to be best matched with Careseekers looking for care, set their wages, post their weekly availability, receive weekly payment, and build their resume and portfolio with real experience. Careseekers and family members looking for someone to give care for their parents or loved ones, can use the website to search for qualified nurses, CNAs and caregivers, are matched with a caregiver who can best can deliver care to specific care needs, monitor their caregivers’ schedules and payment online and receive personal support from the nurse that is assigned to them when they join. Join for free today at WellBeyondCare.com.